The Cassini spacecraft looks toward the dark side of Saturn's largest moon as a circle of light is produced by sunlight scattering through the periphery of Titan's atmosphere. This cool space wallpaper shows Cassini spacecraft looks toward the dark side of Saturn's largest moon as a circle of light is produced by sunlight scattering through the periphery of Titan's atmosphere. A detached, high-altitude global haze layer encircles the moon. 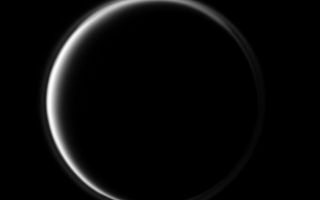 Small particles that populate high hazes in Titan's atmosphere scatter short wavelengths more efficiently than longer visible or infrared wavelengths, so the best possible observations of the detached layer are made in ultraviolet light. The image was taken in visible blue light with the Cassini spacecraft narrow-angle camera on Oct. 9, 2009.